Box Text: When your life can be taken in a split second, your commands must be taken even faster. 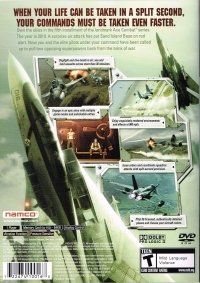 Own the skies in the fifth installment of the landmark Ace Combat series. The year is 2010. A surprise air attack has put Sand Island Base on red alert. Now you and the elite pilots under your command have been called up to pull apart two opposing superpowers back from the brink of war. - Dogfight and dive-bomb in air, sea and land assaults across more than 30 missions. - Engage in an epic story with multiple game modes and unlockable extras. - Enjoy exquisitely rendered environments and effects at 900 MPH. - Issue orders and coordinate squadron attacks with split-second precision. - Pilot 50 licensed, authentically detailed planes and choose your aircraft colors. 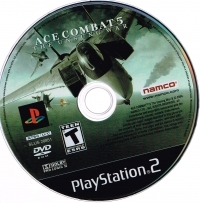 This is a list of VGCollect users who have Ace Combat 5: The Unsung War in their Collection. This is a list of VGCollect users who have Ace Combat 5: The Unsung War in their Sell List. 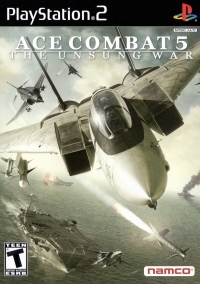 This is a list of VGCollect users who have Ace Combat 5: The Unsung War in their Wish List.